Today, you are a member of... The Yam is in the Bag - You Are A Member! May spelled backward is yam, members. Besides being mistaken for that lesser tuber root, the sweet potato, The Yam is also a dance number from the psychoanalytic comedy starring Fred Astaire and Ginger Rogers, Carefree. Storyline: Amanda (Ginger) gets sent to a shrink (Fred) by her boyfriend because she’s waffling on the marriage question; eventually there’s dancing; it doesn’t involve the boyfriend. 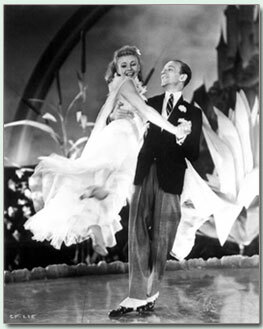 Carefree was one of the first films to spotlight Freudian therapy and The Yam cited as one of Rogers-Astaire’s more difficult numbers, where every couple steps, Fred sticks out a foot and swings Ginger over it. Consider May this year’s rhizomatic dance move: it’ll shrink your head, swing you in the air, and indeed get you in a carefree state of mind. Don’t mistake it for a subterranean root system.